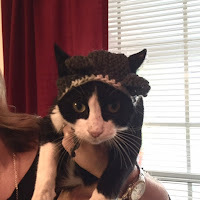 In honor of Hallie's role as a mouse in The Nutcracker (and because she can knit just about anything), Grandma Susie made Tux a little gray and white mouse hat. He looked adorable, but as one might expect, he did not love wearing his new accessory. His new Santa hat made him even unhappier. "Someone" needs to work on getting into the holiday spirit.